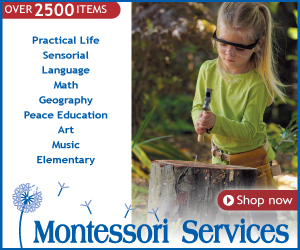 Several weeks ago, I received this amazing kit from Montessori by Mom in the mail. 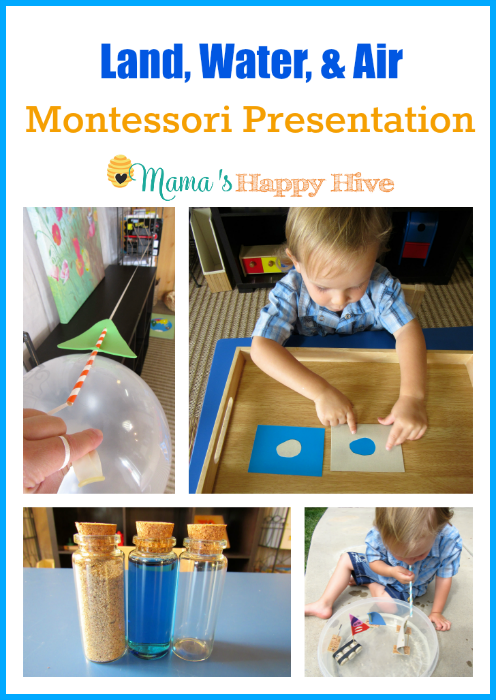 It arrived in a well packed box containing all the materials that are needed for a land, water, and air Montessori presentation! 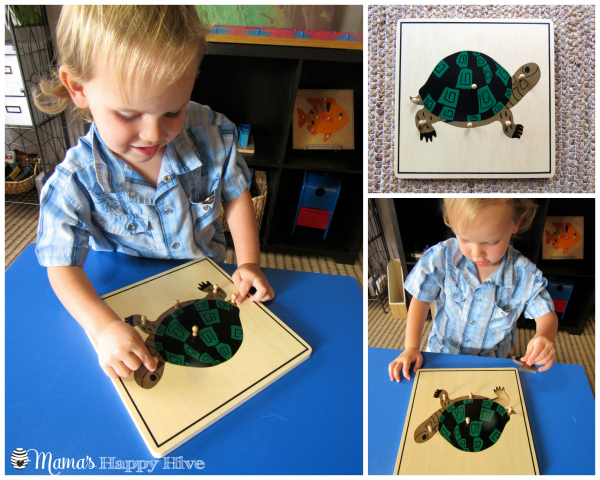 The kit also includes an awesome Montessori turtle puzzle, that we will enjoy in our home for many years to come. 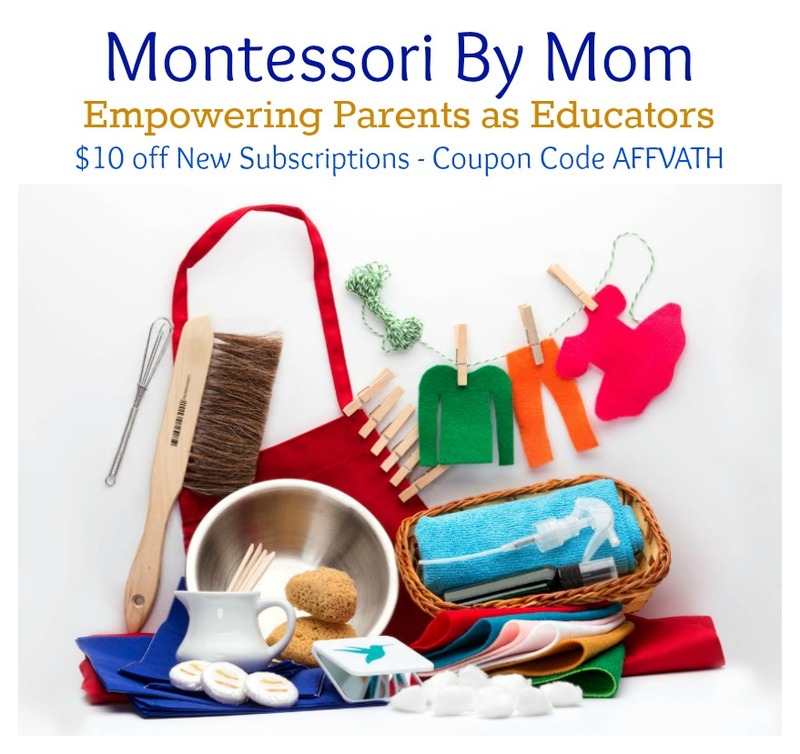 The kit has a pamphlet that gives directions for locating the tutorial videos on the Montessori by Mom website. These tutorial videos are very helpful for understanding how to assemble and present each activity in the kit. 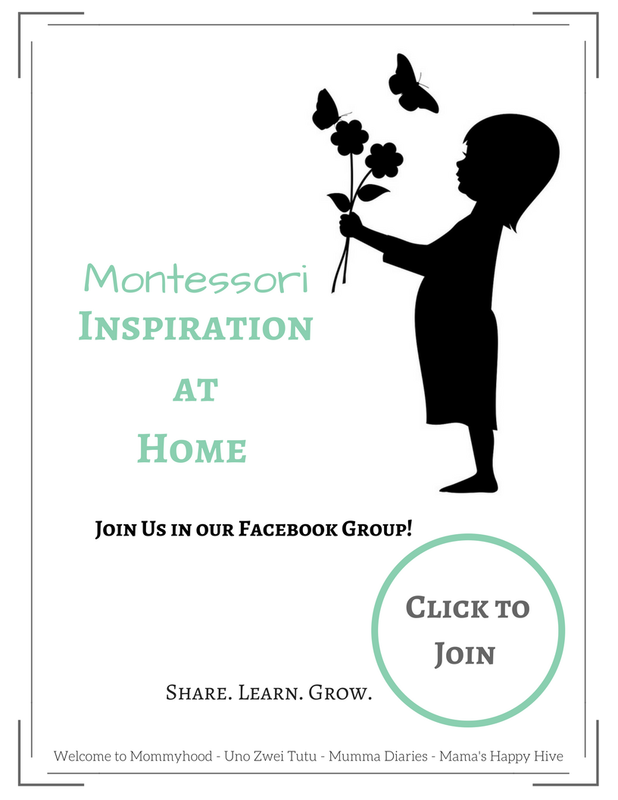 The tutorial presentations are based on years of Montessori classroom experience and are a wealth of valuable information for instructing a child in the home environment. The videos were clear and easy to understand. 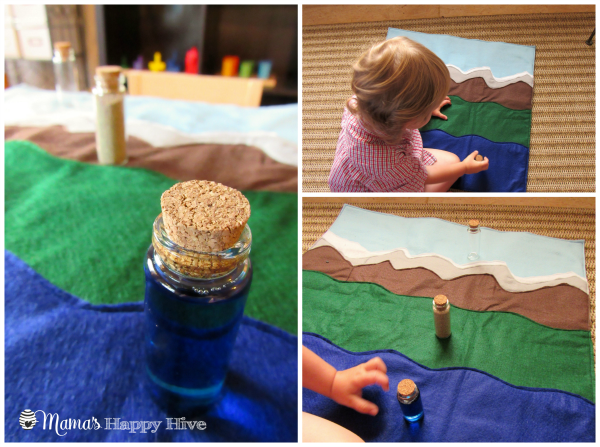 The kit includes three petite glass bottles with cork tops and a (rolled up) poster that shows earth's water cycle. One bottle I filled with sand, another water, and the third I left empty. 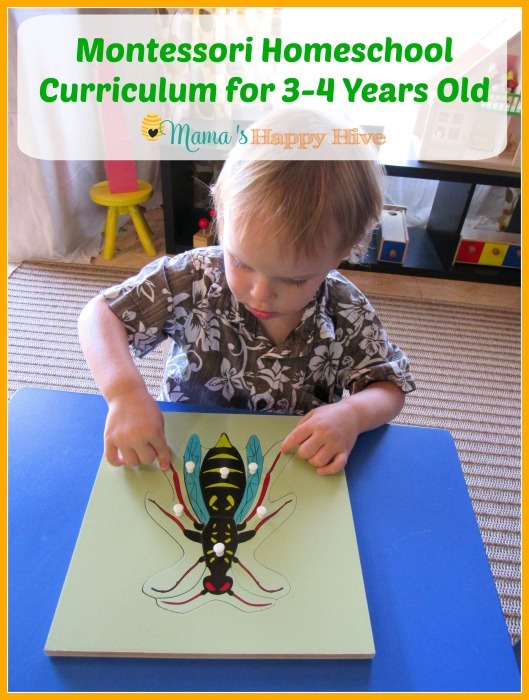 After I demonstrated the lesson for Little Bee, he then placed each bottle onto the corresponding parts of the poster. The kit also includes 36 beautiful and sturdy cards for land, air, and water. I love the adorable little bottles, the well-made sturdy identification cards, and the beautifully illustrated poster. However, the poster was difficult to use after it had been rolled up tightly for shipping. It would not lay flat, so I taped it to our presentation tray. Thankfully, when I removed the tape later it did not tear the poster. The poster is wonderful (despite its wrinkled state) and I plan to use it again. I purchased this gorgeous felt land, water, and air mat from the Happy Felt World Etsy shop several months ago. 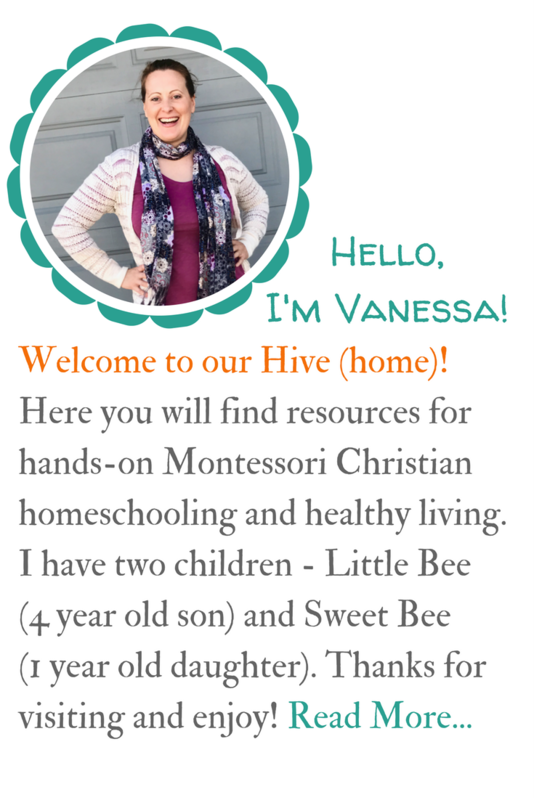 I decided to use this as an additional presentation mat for Little Bee to practice placing the corresponding bottles and also the identification cards. 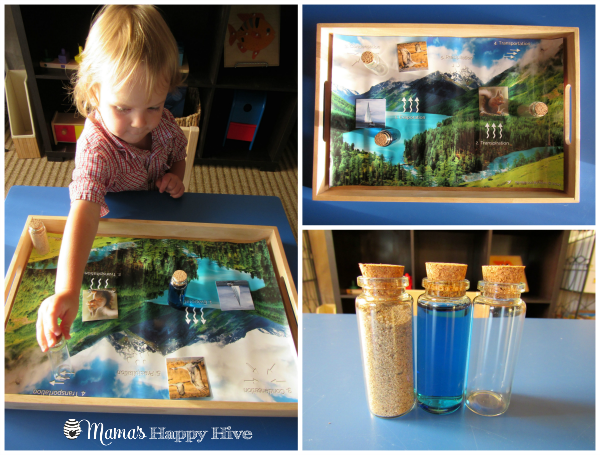 I am very pleased with how this felt presentation mat worked wonderfully with the presentation bottles and cards. It's a large mat and can easily fit all the presentation cards. The identification cards are made from a thick material with a protectant layer for lots of handling. On the back of each card is a brief description of the object on the front. The cards are lovely! 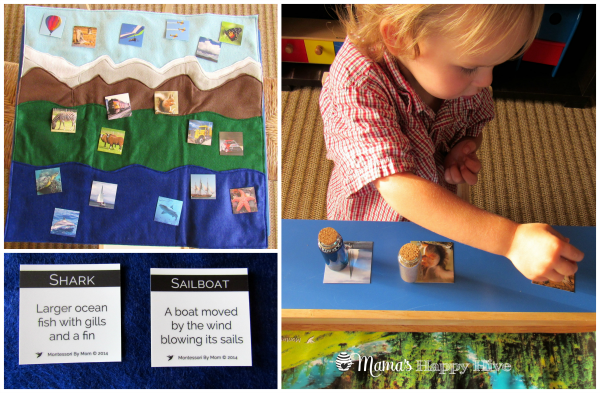 The back side of the water cycle poster is a matching game that can be played using the identification cards. Little Bee loved this game and spent a significant amount of time examining each photo and finding its match. 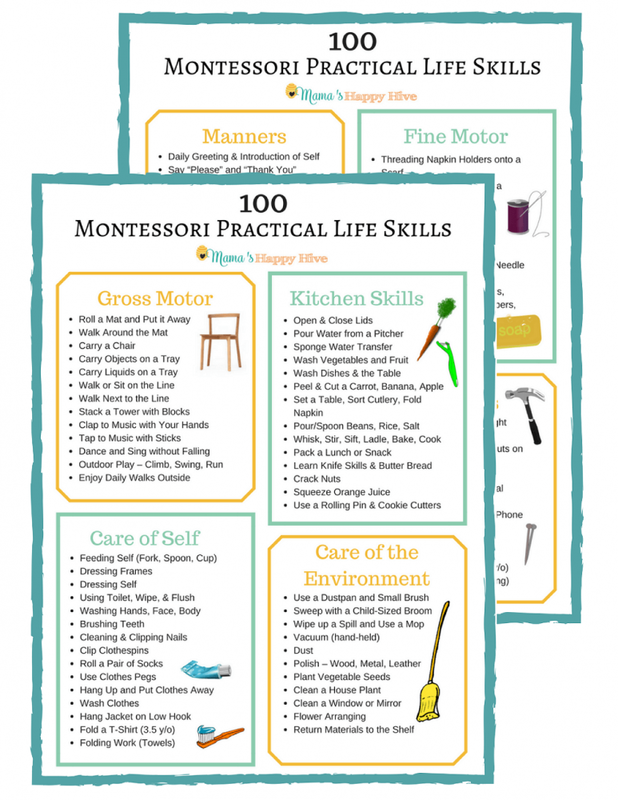 The tutorial videos explain more activities that can be presented using these cards and bottles with older children. 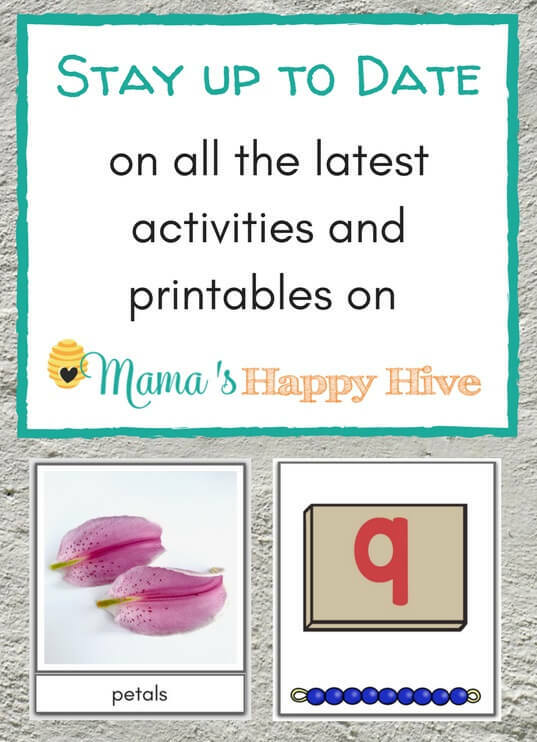 We did not complete all the activities because Little Bee is not yet ready for the advanced presentations. However, the exciting part of this beautiful kit, is that we can come back later and enjoy several more days of land, water, and air Montessori activities! The land and water form cards are also made out of a thick material with a description written on the back of each one. 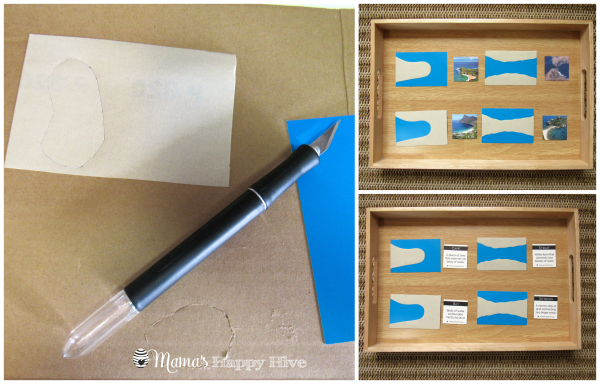 The kit includes self adhesive sandpaper to help with finishing the land and water form cards. I found that using an X-acto knife was the easiest way to cut out the more challenging lakes. The preparation time for these cards took me about an hour and that included watching the videos. Little Bee was quickly able to identify the difference between an island and a lake. He appeared to enjoy the feel of the rough sandpaper. I only gave him these two cards at this time. We will come back to learn more when he is older. There are a total of 8 land and water form cards. The turtle puzzle was a big hit for Little Bee and he was fascinated with the turtle's "tiny" tail. We concentrated on taking the puzzle apart, naming the parts of the turtle, and then putting it back together again. Please note, that the tutorial videos that come with this kit, give several more fun activities that can be enjoyed with this fabulous turtle puzzle. The kit includes the materials and instructions for creating four adorable cork boats for floating on water. 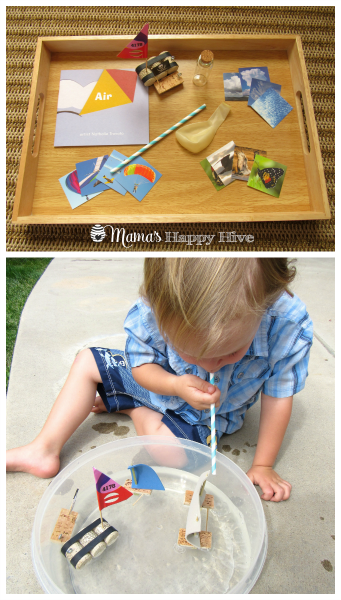 Little Bee loves all things that involve water play! 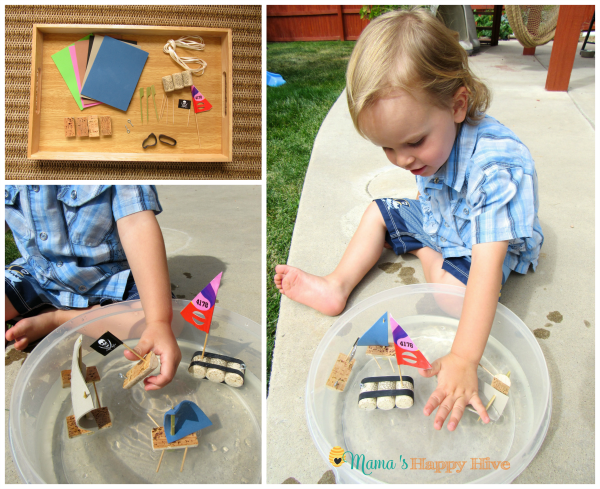 This activity is a wonderful way to teach a toddler about water and objects that float on water. An older child could enjoy assembling and then floating the boats. 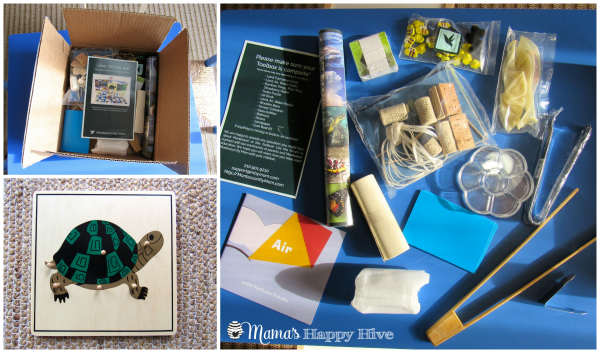 Inside this kit are several activities for learning about the meaning of air. Air can be a challenging concept to understand because you can not see it. There is a child-sized illustrated book about air, balloon activities, sky and cloud cards, and straw with a ribbon to help a child learn about the concept of air. In the photo below, Little Bee used a straw to blow the cork boats around on the water. The preparation time, for the boats, took me about half an hour and that included watching the video. 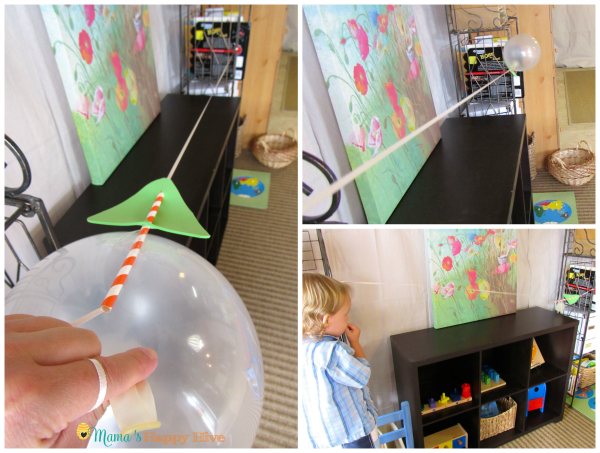 Another super fun activity was blowing up a ballon, attaching it to a straw, and watching it fly across the ribbon. 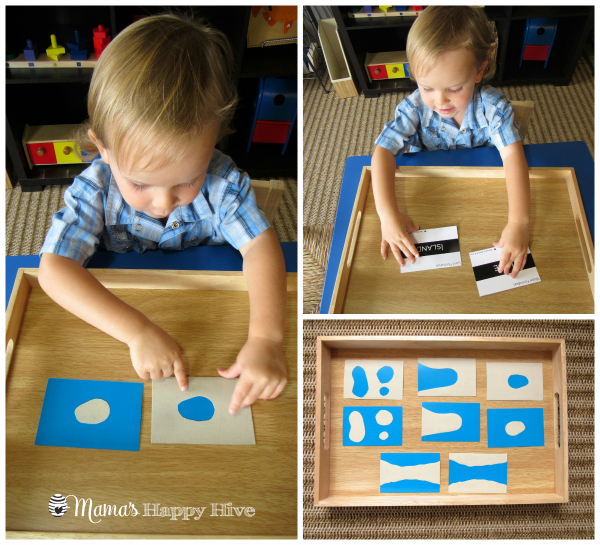 Little Bee wanted to do this activity over and over again! One of Little Bee's favorite practical life activities is transfer work. 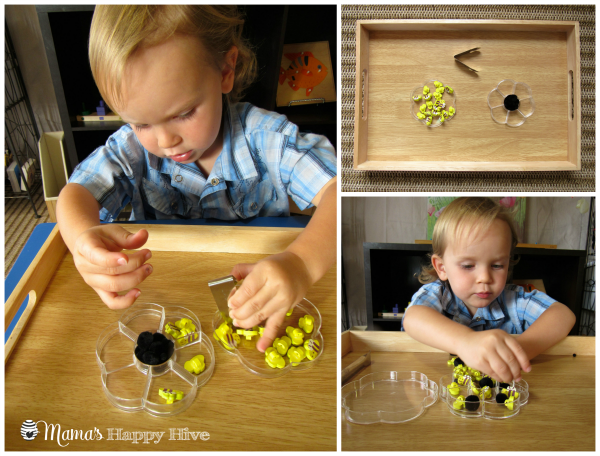 This kit includes a swarm of adorable wooden bumble bees and a plastic flower tray. The bees fly (transfer) through the air with three different transfer tools that are included in the kit - a small strawberry huller, medium metal tongs, and long wooden tongs. Overall, I think this kit is amazing and totally worth the cost. 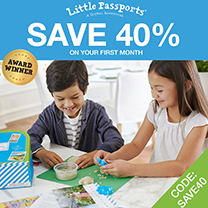 It is full of thoughtful and inspiring activities for children of all ages to enjoy. We plan to use this kit time and time again, over the next several years. I can't wait to order my next kit! The space explorer, helping hands (practical life), and shells & starfish unit activities look fantastic! 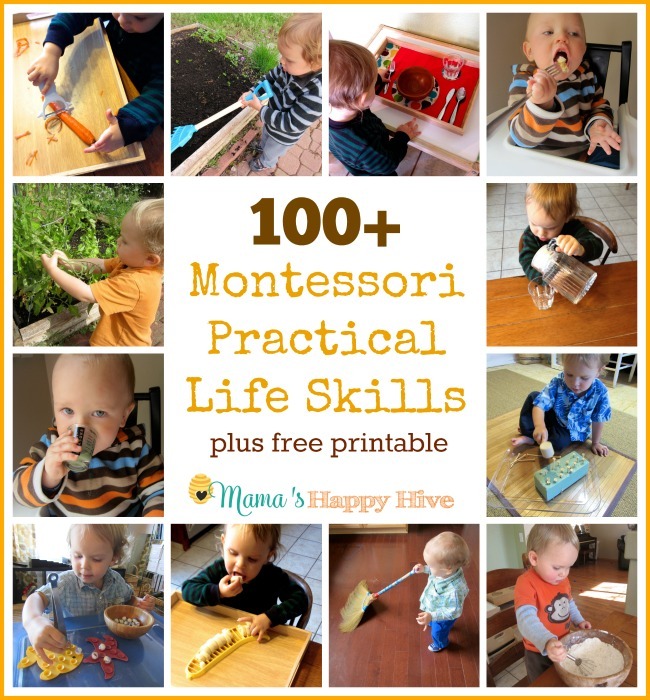 Follow Mama's Happy Hive's board Montessori Inspiration on Pinterest. This looks awesome!!!! I love all of the hands on activities. 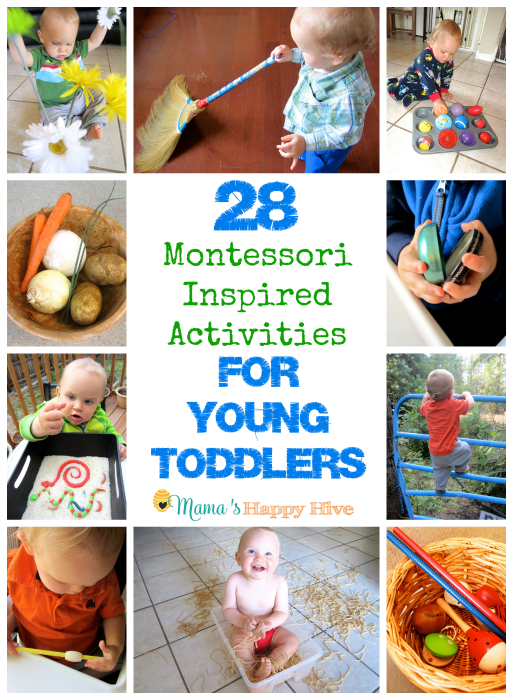 These are such great ideas and activities. 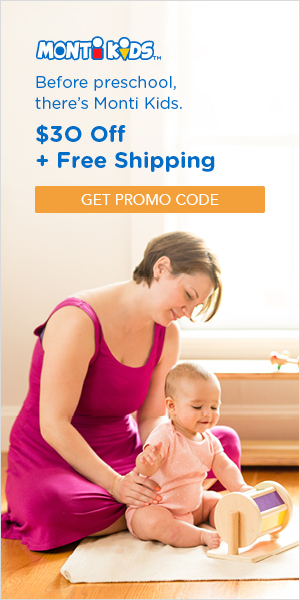 It is no surprise that your son is so clearly enthralled! Looks like endless fun!!! What a great set of materials! I love the idea of Floating Cork Boats on the Water. Wow! This set looks awesome. The jars for substances are really cute! Btw I saw you shelf on one of the photos, it is so beautiful! And this big painting with flowers! Love your environment! amazing i wish you could send me the video on making floating boats. The setting are amazing and the creativity of the teacher is really active. Thank you!